A Twitter search for the terms "PSVR" and "sick" occasionally brings up people saying things like "PSVR Thumper the game is so sick" and "PSVR is so sick". But the more common usage is from people complaining that Sony's new virtual reality system at some point made them feel sick. Driveclub running in PSVR. Screenshots from the game are captured from the game's "spectator mode", a 2D representation of what the VR player sees. Since PSVR's launch on Thursday, there have been a trickle of tweets about the topic, most often from users complaining about the first-person racing game Driveclub. One YouTuber tweeted that they were "enjoying PSVR" but noted that "Driveclub VR took all of 20 seconds before it made [them] totally sick". Another said nausea struck in 10 minutes. Another Twitter user said they could "barely get through a full race in Driveclub VR without feeling sick". I've had mixed results with the game. 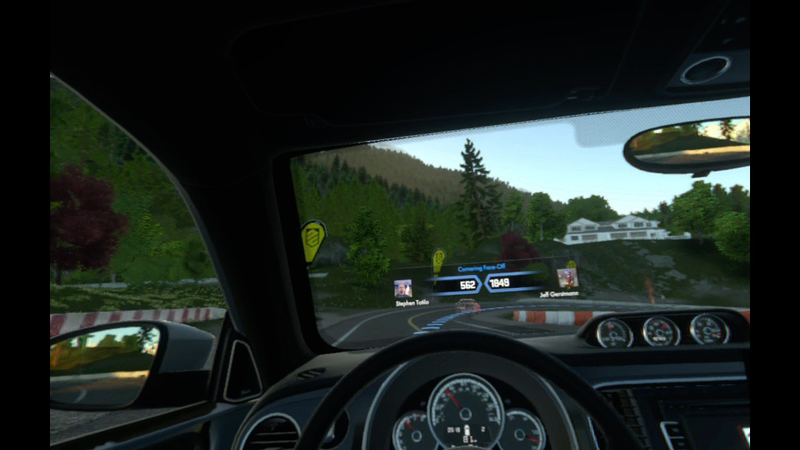 When I first tried Driveclub in VR last week, I felt a little queasy. Nausea in VR hits immediately. You feel warm and a little ill. Usually a bad turn will do it, though when I tried Driveclub again today I felt mostly fine. I aced the game's initial race, a high-speed two-loop oval run, with no discomfort. The game's second driving challenge is a slower-paced yet still speedy drive through windy roads. During a rapid succession of tight turns I felt slight motion sickness, but not enough to make me stop playing. VR gaming nausea is by no means automatic, but it is certainly an element of the discussion of this new style of gaming being ushered in by Oculus and Valve earlier this year and now by Sony with this month's PSVR. It's a physical fact of how VR gaming works. A user's brain and inner ear can easily get confused by VR imagery, especially if the movement a user thinks they are seeing doesn't match the movement (or lack thereof) of their own body. VR game designers have been able to avoid nausea in their players by keeping action in their games relatively slow and by offering blinkered or stuttered first-person camera movement. Smoother, accelerating movement can quickly make a user feel ill. The PSVR sports game Rigs clouds the user's peripheral vision with blackness if they turn their head quickly. The system's Batman game, Arkham VR, has its players run forward via a series of non-nauseating short teleports. Comfort settings for the PSVR-compatible part of Rise of the Tomb Raider. Comfort mode was good. "Free", however, made instantly feel sick. The PSVR game that most severely made me feel ill was Rise of the Tomb Raider's Blood Ties first-person side mission, but only when I removed the game's comfort settings and tried to play it with standard, smooth first-person movement. A few steps, a turn and I got hit with a bellyful of nausea. I switched the settings back to comfort mode, which locked my character's foot position until I teleported her ahead and I felt fine, with zero nausea. "We had a demo for a driving game with the tech, and that was really great when I drove slowly," Yoshida said. "I could view the scenery. It's no longer racing. It's driving, driving through scenery. But when I put on the gas and started driving [fast], it was too much." He said that "many people" who tried it felt ill.
"Mostly, the biggest learning is what makes people sick," Yoshida said. "That's something we definitely want to eliminate." Latency, he reiterated, "is killer." Get that number down and the comfort of VR goes up. There may be people complaining on Twitter that Driveclub made them sick, but there are others thrilled to say it didn't. "Driveclub VR didn't make me sick," one user wrote. "I LOVED it." Another said that Driveclub didn't make him feel bad, except for one "fleeting" moment. The website IGN colour-coded PSVR launch games to indicate how ill they made the staff and gave Driveclub a green for "no discomfort". When a user starts up PSVR, the system warns them about potential motion sickness, but there's no easy way to figure out which users will or won't feel ill.
Motion sickness in VR varies. It varies from game to game and person to person, all the more reason to research the games and find a way to try them before you buy. VR gaming can be magical as long as you've not made a terrible match and found the VR game that will make you barf. I haven't had any issue with it in terms of sickness. Although I have been playing it with a steering wheel in a cockpit setup so as far as my brain is concerned I'm just driving a car. 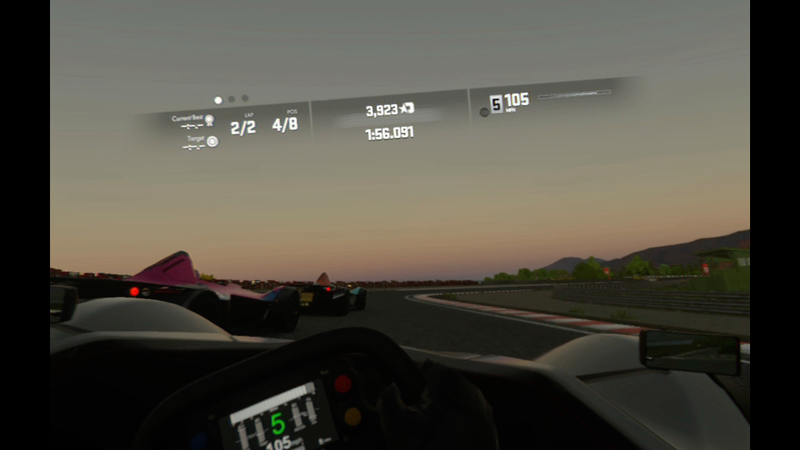 My only complaint is that Driveclub VR looks pretty low res and grainy/blurry, I assume it's being rendered in low res then upscaled to the VR resolution. I'm hoping they will patch it for the PS4 Pro so it looks a bit sharper. It wouldn’t surprise me at all if plenty of gamers would still play even if it did make them feel sick. Sometimes I hear the hours people pour into playing games and I feel sick for them! When I was younger I’d occasionally get so buried in a game that I’d play it long after I’d developed a headache/ starved/ needed to go to the bathroom. I remember playing Warcraft 2 for so long that when I finally went to bed I could still see sprites on the back of my eyelids, or playing an old PC with a monitor that made a loud “click” every time it changed resolution and turned black for a second so long that my brain would hear the click noise when I blinked…..I worry a tiny bit what might happen to you if you did the same thing with VR, if you spent 18 hours in a day with a VR thing on your face as some people will doubtlessly do. These days I play games just to chill. I have near-zero interest in having a sickness inducing monitor strapped to my face, happy to sit out the VR thing until it goes away (as it did in the early 90’s) and re-emerges as something more ergonomic. I didn't get sick, I just didn't think much of it. Objects in the distance are blurry and it really breaks the feeling of immersion. This is why demos for VR games are essential. I have played all the launch games and still haven't felt sick. I got a little dizzy on gear vr dreadhalls but thats because i was jumping side to side trying to make myself sick lol. I got a little motion sick playing RIGS, but that was on launch and had been playing for a bout 4 hours prior. Also got a little sick in the mech game on PS Worlds, but I was quite hung over that day. The Driveclub demo was fine, and in fact even with the lower res, I was so much better than I normally am at racing games. Being able to look into the bends made such a difference. Latency, he reiterated, “is killer.” Get that number down and the comfort of VR goes up. Same with screen games. I find that sometimes graphics settings that do post processing type stuff give me motion sickness, and I think its because of the tiny extra bit of latency they add. I didn't experience any sickness from this game.